Got a new Google Pixel; or should I say Pixel, Phone by Google? You may or may not have noticed as you quickly shoved your sim into your new pride and joy… But there is a weird kinda easter egg on the SIM tray. If there was any doubt over who ‘made’ the phone in your hand, Google left its address on the sim tray. 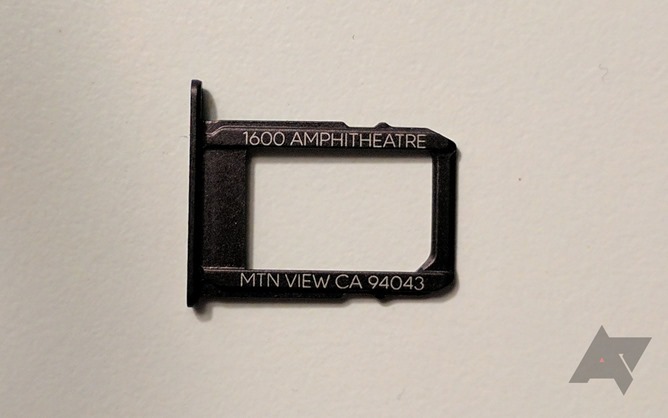 That’s right, you will find “1600 Amphitheatre, MTN View, CA 94043” on the tiny bit of metal, just incase you want to send it home. You can be forgiven for missing the address on the Silver – sorry, ‘Very Silver’ – version, but the image below from Android Police shows the ‘Quite Black’ version with unmissable type. It seems weird at first glance, but Apple displays ‘Made in California’ on all the iPhone SIM trays, so perhaps this is yet another nod/swipe at Cupertino. No other weird hardware has been found as yet. iFixit have done their usual tear down and uncovered quite a few modular components that are easily repaired once the screen assembly has been removed. However, opening the phone is especially difficult in comparison to other models – meaning a repair score of 6.